At the Optimum Health Institute in San Diego, I saw a lady with the loveliest hair I’d seen outside the world of fantasy. Her ivory hair flowed almost to the small of her back. I couldn’t pass her without turning for one more glimpse. I ached to learn her secret. She appeared to be about 45—an age most women’s hair grows fine and lifeless. But hers was full and lustrous. After hearing my expressions of admiration, she let me in on the secret to her lavish hair. She eats seaweed every day. Hair is nurtured by the scalp and blood supply, just as plants are sustained by soil and ground water. Every strand of hair resembles a plant stem in structure. Hair, like vegetation, depends on the quality of the medium in which it grows. We value hair highly for our appearance. For the body, hair is less important. The root is your hair’s only living part. Hair above the root reflects the body’s history, its former nourishment patterns. The body, concerned with its present state of health, its future survival, uses the nutrients it receives to feed its essential organs and tissues first, feeding the hair only if it has a surplus. If the body has an abundance of nourishment, it keeps your hair healthy. But when the body senses a deficiency, it abandons your hair, it being nonessential for life. 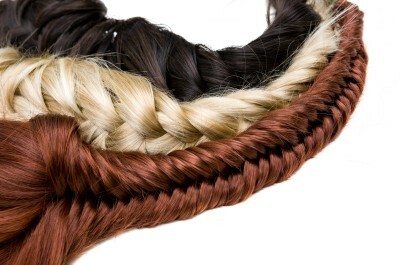 Here’s a myth about the nourishment of hair … Since hair is 97 percent protein, the myth goes, you need a protein-rich diet. Nonsense! Your body can converts carbohydrates into protein. Your body in fact prefers to nourish hair this way. If your diet predominately consists of raw fruits, vegetables, nuts, and seeds, you will have firm, thick hair. Dandruff is an example of how your body eliminates excess fat and protein. These white, dry flakes are nothing but oil and protein clumped together, caused by consuming saturated fats and proteins in animal foods, especially fried foods. My experience: Stop eating meat, no more dandruff. Research shows sodium alginate, a compound found in most seaweed, binds with heavy metals and chemical poisons, flushing them from the body. Sea vegetables help the body to discharge radioactive wastes. They nourish the endocrine system, especially the thyroid and adrenal glands. Iodine in seaweed keeps the thyroid functioning normally, and is high in natural sodium. Sea vegetables, providing plenty of proteins, complex carbohydrates, carotenes, and chlorophyll, stimulate and strengthen the skin, hair, and nails. Brittle hair, caused by a shortage of minerals, too much salt or animal food, or use of drugs (prescription or otherwise), can be restored by eating sea vegetables. Sea vegetables offer tremendous benefits not only for health but for beauty. Kelp, wakame, arame, dulse, and nori are all high-protein vegetables, low in fat. Rich in calcium, phosphorus, potassium, iron, iodine, and other trace minerals, sea vegetables like alaria and kelp are better calcium sources than milk. Sea vegetables, like land vegetables, are high in potassium. Thinning hair is a common sign of aging, even more than graying hair. Hair follicles cannot produce hair in toxic environments. The results: slow and meager hair growth, with strands brittle, and split. When you first begin your 100 percent raw food diet, you might lose some hair. This is part of the cleansing process. But since a raw food diet will give excessive nourishment, your hair will begin to thrive and be much stronger in the long run. Hair loss during transition is only temporary. Don’t panic. Look to your temples for new hair growth—a good sign! 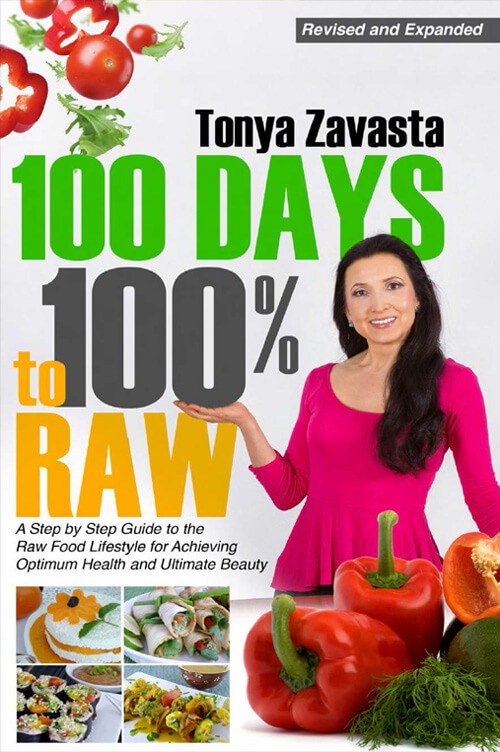 People who had been on the raw food lifestyle for a year reported an amazing result: abundant hair growth—as much as an inch a month. In some cases, gray hair was replaced with strands of original color. Gray hair is often a companion of aging, because the cells in the bulbs that are supposed to produce melanin are dead. They die for the same reasons other cells do. Poor assimilation, hormonal imbalances, and toxic waste buildup in the system are contributing factors. Graying hair is caused by the consumption of saturated fat and protein, as well as salt. Another cause of graying hair is the excessive intake of simple sugars, which leach minerals from the blood, weakening the nutrients that reach the hair. Starving and suffocating hair turns gray. 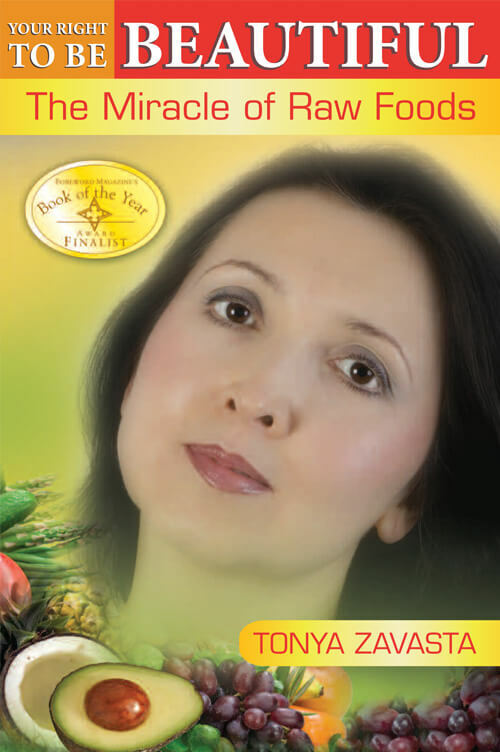 Many people on raw food diets claim that their hair returned to its natural color. I am convinced it’s possible to prevent hair from turning gray or reverse the process if its has already begun. However, heredity is a big factor here. Drink wheatgrass, and wash your hair in it. Nutrients penetrate into follicles and stimulate growth of new pigment-producing cells. Getting results takes persistence, but consider the alternative—artificial coloring is carcinogenic. 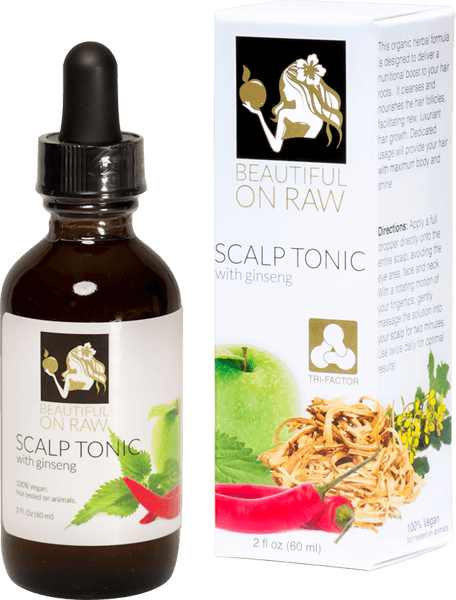 If you simply do not have the time in your day to prepare a wheatgrass concoction for your hair, I now offer a new product on my website: Scalp Treatment for Hair Stimulation. My hair is very fine, so I have to take extra measures to keep it full and vigorous in my mid fifties. RejuvaRoll, aka the “Rolling Bed of Pins” stimulates surface blood flow using a series of small pins in a rolling action. 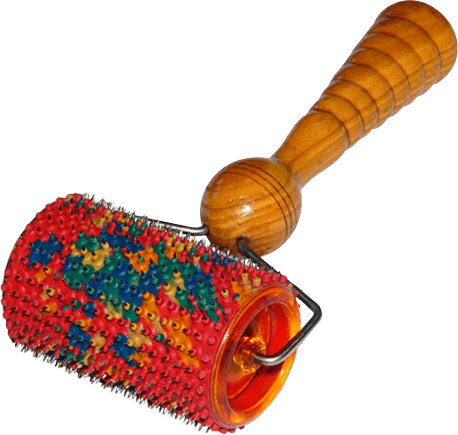 You roll it against your scalp in any direction that seems comfortable. 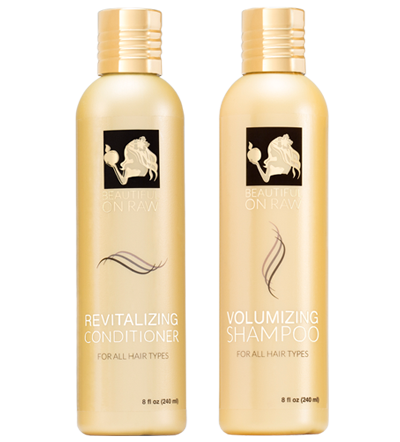 Many users report fuller, healthier hair growth. Actually you can use this device for any area of your body to reduce pain and increase the healing effect of good blood circulation. The Violet Ray has proven effective in alleviating various skin and scalp conditions, such as reducing wrinkles, eliminating acne, fighting gray hair, eradicating dandruff and halting hair loss. 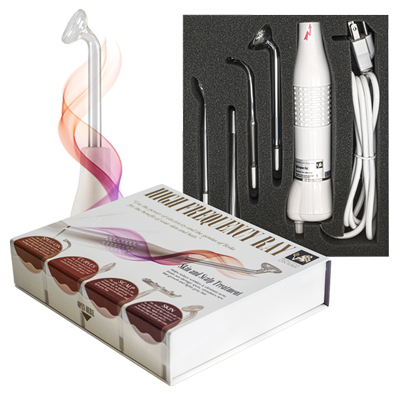 The Violet Ray is a holistic device that will complement your healthy lifestyle and will provide invaluable assistance in revealing your Rawsome beauty. Both of these devices helped me a great deal and I am sure they can do the same for you!